A group of Grauer's gorillas gathered around a dead silverback that was not from their troop. Dian Fossey Gorilla Fund International (gorillafund.org) CC-BY-4.0. Gorillas show signs of grief around the corpses. The closer the social relationship the surviving gorillas had with the dead one, the more noticeable the interaction, sometimes spending days beside it and sleeping in the same nest. Intriguingly, however, they also show extended distress at the death of a stranger. 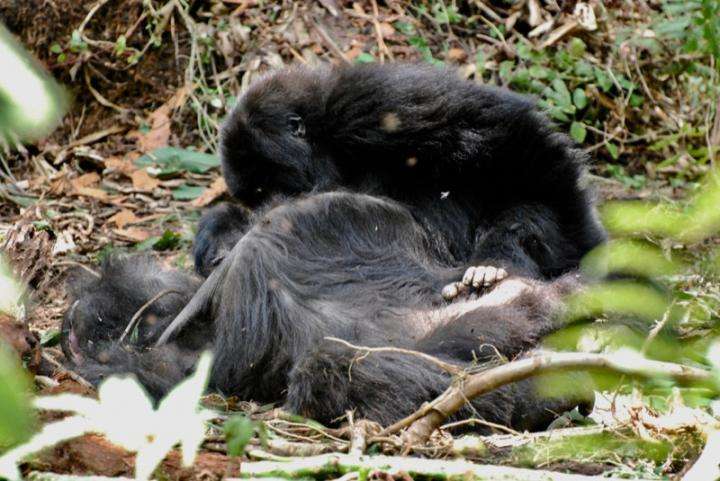 Researchers often miss the opportunity to see how gorillas behave towards the bodies of their loved ones in the wild, since dying members of a group frequently take themselves off to die quietly elsewhere. On the other hand, inhabitants of zoos may be unreliable guides to natural behavior. However, Dr Amy Porter of the Dian Fossey Gorilla Fund is part of a team that watched and filmed what happened when two gorillas in Volcanoes National Park, Rwanda died of illnesses. These have been compared with the discovery of a recently dead individual by a group of Grauer's gorillas in Kahuzi-Biega National Park in the Democratic Republic of Congo. In each case, the gorillas sat with the body, sniffed and poked it, but also groomed and even licked it. One of the dead mountain gorillas was a dominant male, Titus, and the other a dominant female Tuck, both of whom had lived into their mid-30s, a fair age for by gorilla standards. Both came from a group researchers have observed for decades, and whose social relationships were known. As expected, Porter reports in PeerJ, the living gorillas with the closest genetic and social bonds to the dead ones spent most time with the corpses. Tuck's juvenile son “gently tried to move her head with his hands” and even tried to suckle at her breasts, despite being weaned. Older members of the group beat their chests, smashed plants and struck Tuck's corpse in between bouts of staring at the body. The Grauer's gorillas, aside from adult females, displayed “strikingly similar” behavior towards a dead silverback they found, Porter reports. They groomed it and beat their chests around it, even though it was unrelated, and probably unknown, to most of them. Grauer's gorillas are classified as the same species as the mountain gorilla, but a different subspecies, making the similarities in responses even more intriguing. From an evolutionary perspective, this behavior has serious drawbacks. Ebola, which can be easily transmitted from the dead to the living, has been a major contributor to gorillas' critically endangered status. Proximity to victims of trapping may also raise the risk of entire groups being wiped out by poachers. Consequently, it is unlikely the behavior would have survived if it did not reflect something important. Perhaps, being social creatures, a gorilla so overcome by grief that it will stay with a dead relative is more likely to survive than one that doesn't love its family, or care for other members of its species, enough to want to do this.